Learn how to provide feedback and grades on any assignment in your course. Receiving personal feedback is a great motivator for learners. 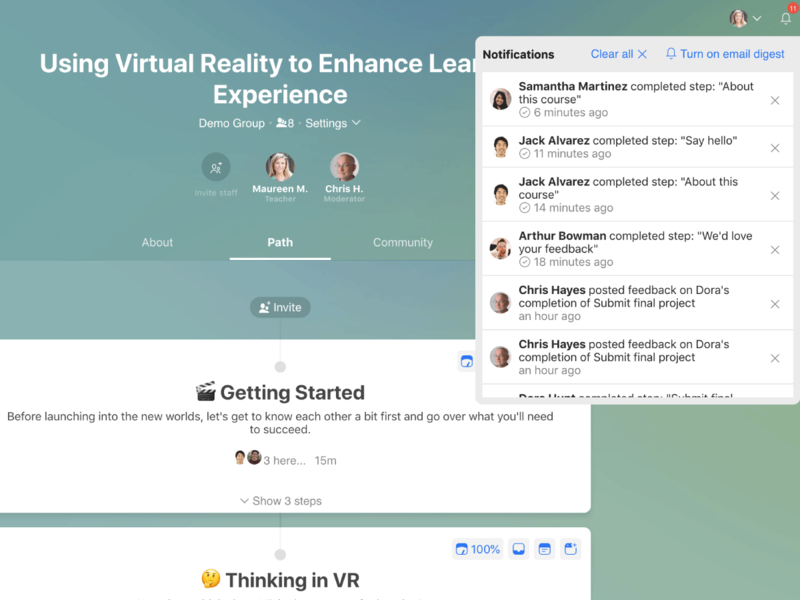 We've designed the review and feedback tools to help you maximize your time and provide timely, relevant feedback each time a learner completes a step that requires your input. Teachers and moderators will receive a notification upon completion of any step set to require manual review. There are multiple ways to access the Review features. Here are the most common. Open the course Path and make sure your "Teach/Edit" button is toggled to "Teach." Use the Review icon on the right to open a list of learner completions. This will open a screen that shows all learner completions and will by default show any steps that require review. Click on the learner to view details and enter your feedback and/or grade points. To view completions on a single step, hover over the step and select the Review icon. You can also open the step and there will be a Review icon in the top right corner of the step. Select this to see learner completions for just the single step you are viewing. If you teach multiple courses, you'll likely find your Teach tab helpful for staying on top of grading. Log in and find the Teach tab on your home page, or select "Teaching" from the main menu. Use the Review icon on each cohort to open a list of learner completions. 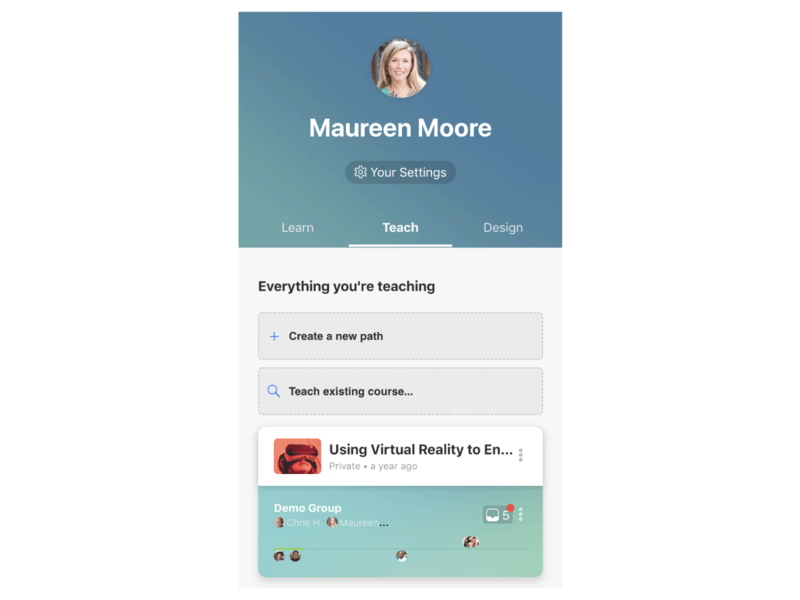 A teacher or moderator will automatically receive in-app notifications when a learner completes a step that requires review. Click on any recent completion from your notifications bell. This will take you directly to the item needing review. Prefer to receive these notifications by email? Subscribe to the email digest to receive notifications by email daily or weekly. See more on managing your notifications. Open the "View Learners" icon from any cohort and select a learner to see all their work in the course. Select any step to review or grade that learner's completion of the step. Admins-only: open the account-wide Community screen from your menu or Dashboard. 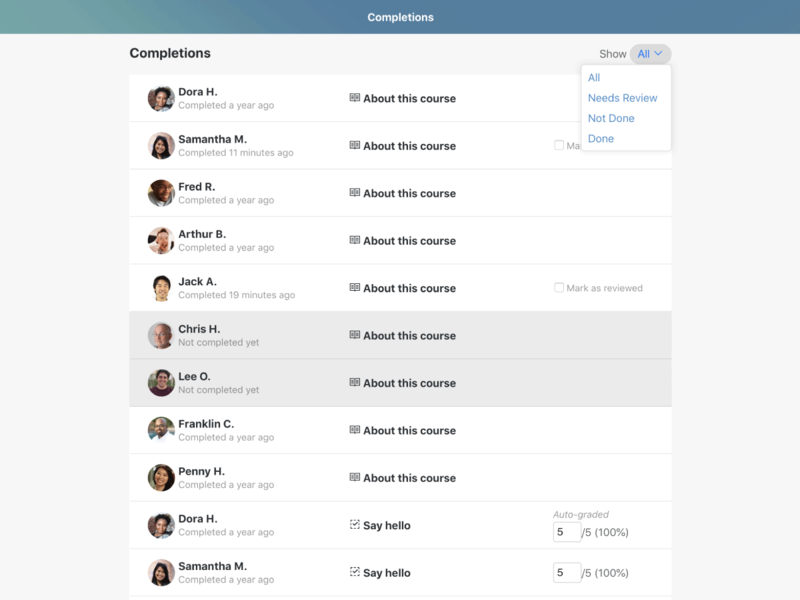 Select any learner, then select one of their courses to see all their work in the course. Select any step to review or grade that learner's completion of the step. With the Review screen open, you will see each learner represented and whether or not he has completed the step. You can sort these by status using the drop down menu in the upper right corner. If the step was an assessment made with our built-in assessment tools, you can review the quiz or test and see how the learner answered. If a file was uploaded, you can click to open the file. You can leave private feedback on any completion that is visible only to the individual learner and other staff with access to Review. your response as a video or audio file. If the step is completed and points are assigned, you will be able to add or edit a grade in the upper right corner. Note that only whole numbers are accepted in the grades. If no points are assigned to the step, but the step requires review, you can optionally leave feedback and mark as reviewed. The feedback screen now supports threaded, two-way feedback. It's basically a private discussion between your school staff and a single learner in the context of any step. The learner can now initiate feedback on the step also, either before or after completion, on steps that require review. They can also respond in-platform or via response to an email notification, and the entire conversation will be recorded in the platform. 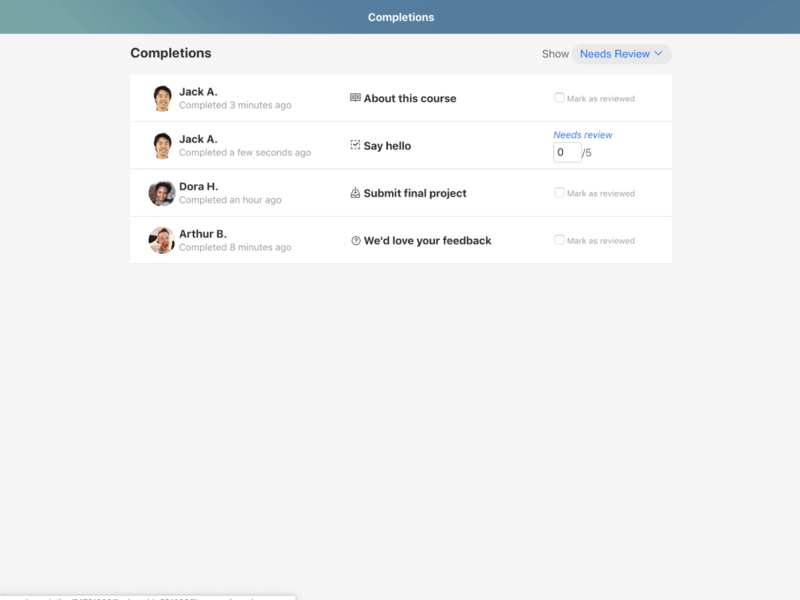 Now, it's much easier for multiple staff members to provide feedback on an assignment. Only the individual learner and staff enrolled in the cohort receive feedback notifications. to the learner when a staff member leaves a grade or feedback. to all staff members who have responded when a learner replies to feedback. Each feedback thread now includes a subscribe/unsubscribe button to allow staff to opt in and opt out of feedback notifications, so if you wish to stop being notified about a particular thread, follow a notification back to the thread and unsubscribe.